These GRP Junction boxes offer a level of mechanical strength by using a non standard form of Glass Reiforced Material in the manufacturing process. This means that when the enclosure is exposed to a fire, the structure holds together even in the event of the resin being depleted due to extreme temperatures. 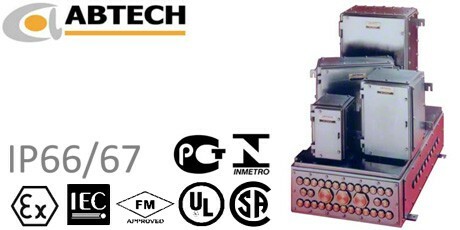 Featuring an innovative labyrinth seal system Abtech BPG Junction Boxes are tested to and have passed IP66/67. Abtech BPG Fire Rated Junction Boxes are available in 16 sizes. The SX range was specifically designed to meet the harsh conditions of the North Sea and is capable of achieving IP66 and IP67. In addition IP68 enclosures can also be offered for depths up to 120ft. Please contact us for further details. Mild Steel Junction Boxes can accommodate various paint options (most RAL colours). Numerous Anti Corrosion finishes available. Manufactured from 316 grade stainless steel to give the maximum environmental protection. The main body is manufactured from 2mm thick sheet. The mounting straps and gland plates manufactured from 3mm thick plate. Cable entries can be drilled in the enclosure door or sides or through the gland plates, if fitted. Entries may also be drilled through the rear face of the enclosure (EEx’e’ versions also).